The 32nd Lake Tahoe Autumn Food & Wine Festival, held at the Village at Northstar, saw Martis Camp take best food and beverage pairing with a pan-seared Sonoma duck breast with wild mushrooms, golden beet and Bing cherry mole matched with Luli Wine’s 2015 Santa Lucia Highlands Pinot Noir. Copper Lane Café and DNA Brewing won the People’s Choice award with a pulled pork, slaw and Imperial Red Ale reduction on a thick potato chip paired with Red Imperial Ale. Returning champion William Burns of Moody’s Bistro, Bar and Beats won the Blazing Pans Mountain Chef Cook-Off for the second year in a row, beating chef Brynn Madden of Nourish Natural Foods. South Lake Tahoe’s eighth annual Sample the Sierra took place at Bijou Community Park. Chef Anthony Schiavone of Bespoke Private Chef Services, Stephen Gill of Cherry Bomb Catering, Kristina Forsberg with Hard Rock Hotel Tahoe and Patrick Harrity of Cold Water Brewery & Grill competed in the Sierra Chef Challenge, using the CSA box ingredients plus a packet of Pop Rocks to create a three-course meal. Harrity won with a honey-seared quail breast with a wilted chard salad and cranberry vinaigrette (appetizer), smoked pork chop over curried chickpeas with Major Grey chutney (entree) and fritter over white chocolate and cranberry mascarpone with sweet pea caramel (dessert). Lake House chef Jimi Nakamatsu earned the Best Experience award, putting the restaurant’s new food trailer to work preparing pork belly steamed buns with heirloom tomatoes, white corn, jalapeños and cilantro with a char-sui barbecue sauce, paired with BellaGrace Vineyards. The Squaw Valley Inn, home to the PlumpJack Café, is being redeveloped as the PlumpJack Squaw Valley Inn & Residences, set for completion in December 2019. The restaurant will stay operational until demolition begins in the spring. Stay tuned for details on the property’s new dining options. This winter, look for a major overhaul of High Camp, Squaw Valley’s mid-mountain facility located at 8,200 feet via the aerial tram. Terrace Restaurant & Bar will be completely renovated and open in time for the holidays. A new High Camp Marketplace will move to a redesigned space on the top floor with grab-and-go meals and snacks, coffee drinks, wine and beer. Silvey’s Café on the mezzanine level of the building will be removed and converted to a family seating area, including a play area for kids. The Poolside Café will reopen as Granite Bistro by December 20. Russell Coffman, a native of Palm Springs, California, and graduate of culinary school at the Art Institute of California in Santa Monica, has replaced longtime executive chef Scott Yorkey, who stepped down to help care for his daughter Kayla, who is battling cancer. Coffman worked with Bradley Ogden and Johnny Church at Root 246 in Solvang, and under Wolfgang Puck and Tetsu Yahagi at Beverly Hills’ Spago. Most recently, he held positions as sous chef and banquet chef at Martis Camp. Sugar Bowl has partnered with two-time James Beard Award–winning chef and renowned San Francisco–based restaurateur Traci Des Jardins. The chef, who also launched Manzanita at the Ritz-Carlton Lake Tahoe, is helping develop menus around the resort, including the Nob Hill Cafe at the Village Lodge, which is getting a total makeover for this winter. 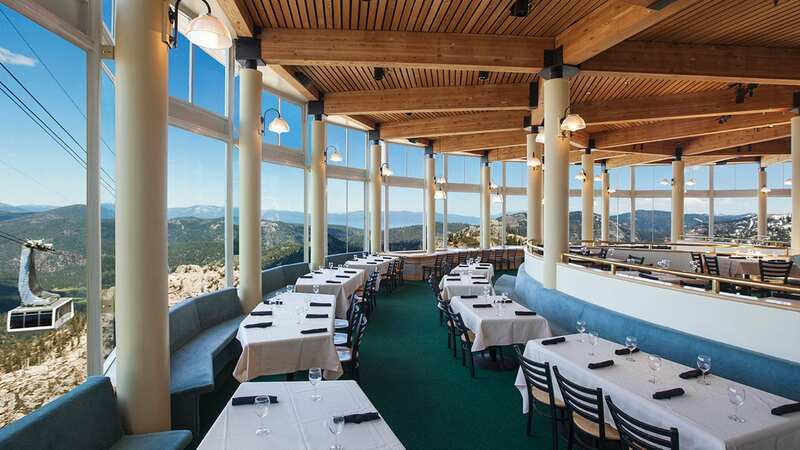 Northstar California is again offering its Mountain Table Dinner series at the Zephyr Lodge (accessed via gondola), with menus featuring local and regional products, live music and peak views. Each long-table, family-style dinner is paired with a winery: Simi on January 12, Prisoner on February 2, Rodney Strong on February 16 and Charles Krug on March 9. Reservations are required; tickets are $148 per person. For more information and to register, go to www.northstarcalifornia.com.